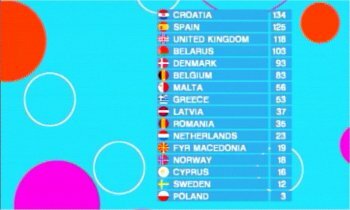 For all those people who are interested in the Junior Eurovision Song Contest, here are the results and details for 2003. The first Junior Eurovision Song Contest took place at the Forum Arena in Copenhagen, Denmark on 15 November 2003. The contest last just over 2 hours. The winner of the 2002 contest was won by Razz from Denmark with the song Kickflipper but only 3 countries entered. The 2003 contest was the first to televised across Europe. Camilla Ottesen and Remee hosted this event. Some famous pop stars performed on the night during the interview act. Sugababes and Busted. The winner was decided by televoting, as like the main Eurovision Song Contest. Yet again, Cyprus vote for Greece and Greece vote for Cyprus. This was the first Eurovision where advert gaps was added to the contest, especially it was shown on ITV1 in the UK. Catchy Theme Tune. 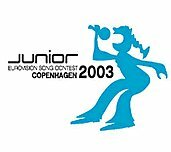 The 2004 host will not be the winner of the Junior 2003 contest. The host for 2004 Junior Eurovision Song Contest will be held in Lillehammer, Norway on Saturday 20 November 2004. The UK decided not to host the event. The 2005 Junior Eurovision Song Contest may be held in the Netherlands but a total of 5 countries want to hold it. Confirmation of this will happen later. It is also the first time an Eurovision Song Contest will be released on DVD. The 2004 Eurovision Song Contest has been released on DVD. Here are the songs and artist who entered the 2003 Junior Eurovision Song Contest and their final score. For song lyrics click here. Here are the results as cast by the following ITV1 Television Regions. Singers, ages and where they are from. C: Ellis De Bie(12) from Tamworth, Staffordshire. D: Lucy St Louis (10) from Palmers Green, North London. The 2004 host will not be the winner of the 2003 Junior contest. The host for 2004 Junior Eurovision Song Contest will be held in Manchester, UK on Saturday 20 November 2004, not London as first thought. For visitors comments on the Junior Eurovision Song Contest 2003, please click here.